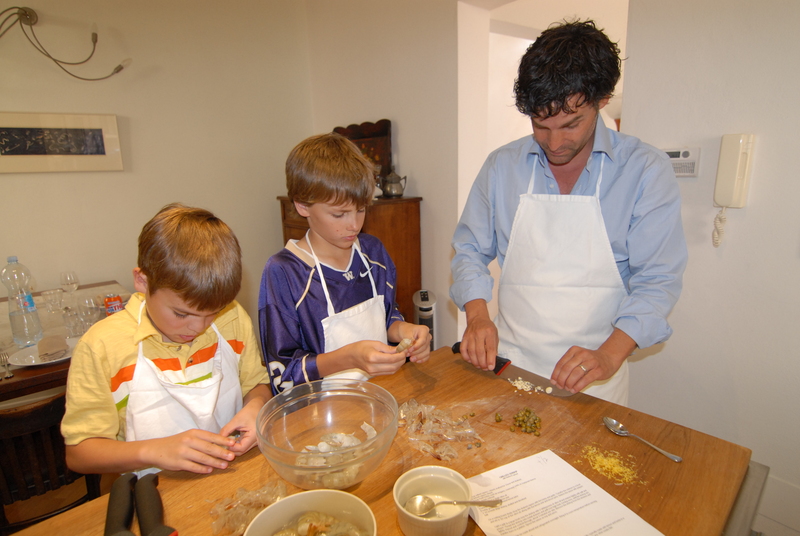 Christine teaches all-day cooking classes in her kitchen just a couple blocks away from our apartment. We found her on-line before leaving the United States and signed up. 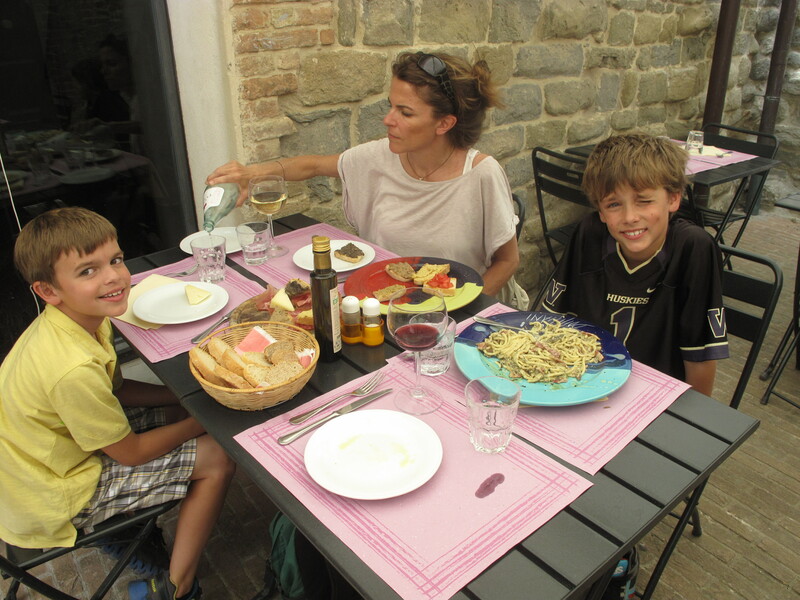 Today we spent seven hours learning some of her favorite Umbrian specialties. At 10:00, Ray and I joined her for grocery shopping so we could see all the cool little stores she visits. We met a black truffle forager, an herb and nut vendor, a pasta maker, a cheese seller, a greengrocer, and according to Christine, the best butcher in all of Perugia. After 2 ½ hours of grocery shopping, we met Tom and Matt back at her house and began preparations for our six course feast and olive oil tasting. To make the sauce: Finely chop the capers with the herbs and garlic. Transfer the mixture to a bowl and stir in ½ cup of the olive oil along with the lemon zest and lemon juice. Season with salt and pepper. The sauce can be made ahead and refrigerated. To make the shrimp: Light a grill. 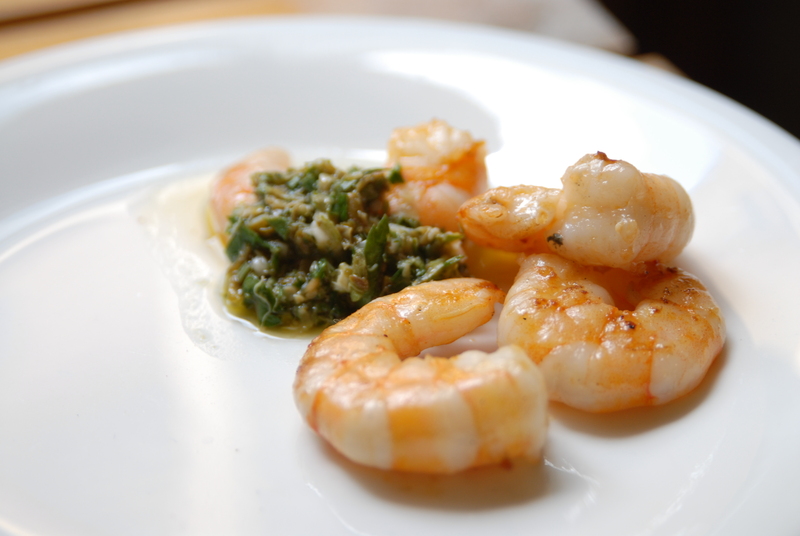 In a large bowl, toss the shrimp with 2 tablespoons olive oil and season lightly with salt and pepper. Thread the shrimp onto skewers and grill over high heat, turning once, until the shrimp are lightly charred and cooked through, about 3 minutes per side. Remove the shrimp from the skewers and transfer them to a platter. Spoon the sauce on top and serve with bread. Mince one of the truffles and place in a mortal and pestle. Pound to a fine paste. Add the garlic and a little salt and pound again to integrate the ingredients. And a few grindings of black pepper, mix in the softened butter and set aside. Cut the remaining truffle into paper-thin rounds using a truffle slicer or sharp mandoline. In a small saucepan, warm the olive oil over low heat, add the truffle slices and set aside to steep for about 10 minutes. Cook 2 large or 4 small servings of pasta until al dente. Remove the pasta from the water and place in a wide sauté pan. Add the truffle butter mixture to the pan and toss lightly to heat. Serve at once, drizzling each portion with some of the reserved truffle slices. Tom pulverizes black truffles and garlic. He said this was the best pasta he’s had in Italy. 1 pound (8 slices) pork from a tenderloin, sliced about ½ inch thick. Lightly pound the meat slices until they are about 1/8-inch thick. Dry well with paper towels and place in a plastic bag with the flour. Shake the bag to coat the slices evenly. Shake off the excess flour and set the meat aside. Lightly coat a sauté pan with olive oil, and when it begins to shimmer, brown the meat slices in batches. Work quickly and do not overcook them or they will toughen. Transfer to a heatproof dish and keep warm in the oven. Pour the wine and lemon juice into the pan and cook, scraping up the browned bits with a wooden spoon. Stir in the capers and parsley and cook a minute more just to thicken the sauce a bit. Season to taste with salt and pepper. Pour the sauce over the pork and serve immediately. This recipe also works well with veal or chicken. Preheat the oven to 350. Spread the walnuts in a pie plate and toast until golden, about 10 min; let cool then chop coarsely. 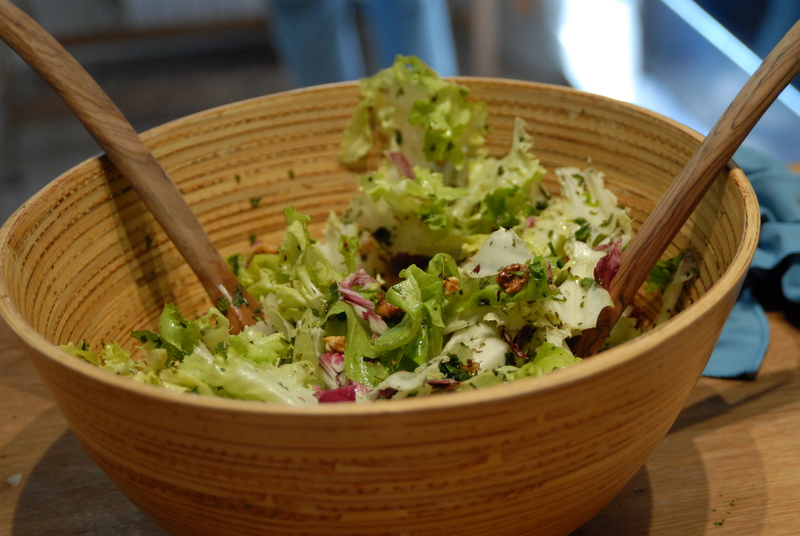 In a large bowl, put the figs, greens, herbs, pecorino and walnuts and toss gently. Sprinkle with enough extra virgin olive oil to lightly coat all of the ingredients and toss. Sprinkle lightly with salt and freshly ground pepper. Toss again. Repeat with the vinegar; taste and adjust seasoning. Peel and core the pears leaving them whole with the stems intact. Cut a small slice from the bottom of each pear so they stand upright. Place the pears in a saucepan just large enough to accommodate them snuggly. Add the wine and enough water to cover the pears. Squeeze the half lemon to top of the pears and cut off a slice of peel, adding it to the pot. Add the cinnamon stick. Cover tightly and let simmer slowly for about 25 minutes. Test with a toothpick after 20 minutes. When the pears are well cooked, but still firm, remove with a slotted spoon to a dish and allow to cool to room temperature. Put the sauce back on the stove and briskly cook down to make a syrup. Meanwhile, place the chocolate and heavy cream in a small saucepan over (but not in) simmering water. Stir until the chocolate and cream are well combined, shiny and smooth. 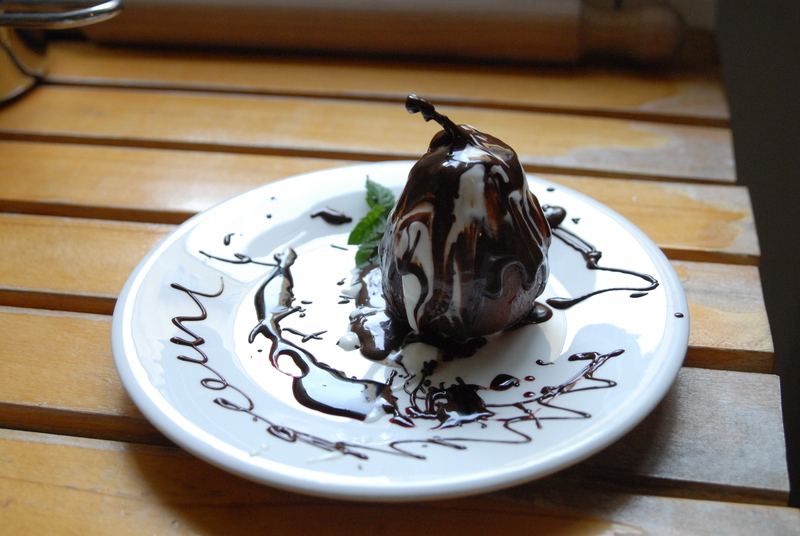 Hold the pears by the stem over the chocolate then dip a fork in the chocolate and drizzle it over the tops of the pears. Place the pears in serving dishes and let rest a few minutes before garnishing with mint leaves. Whip the Marscapone cream. Add it and some of the syrup on top and around the pears. Serve. 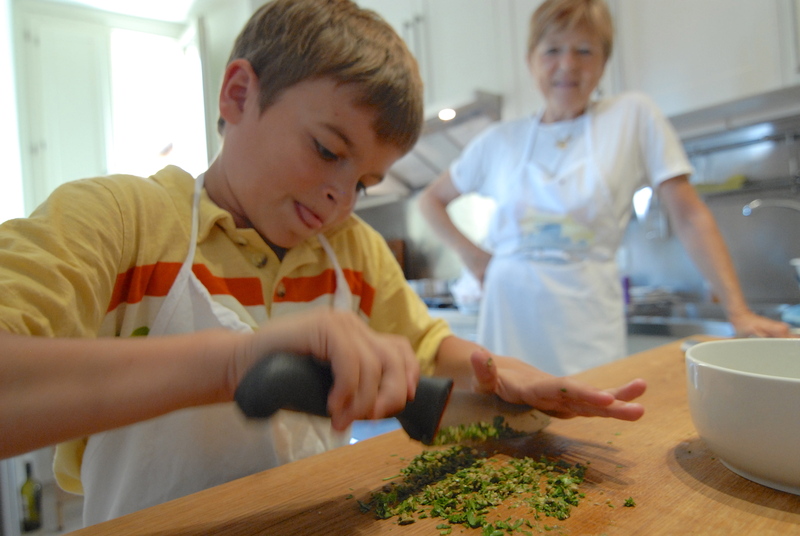 Christine offers cooking classes until September and then again in May. I will be taking more. 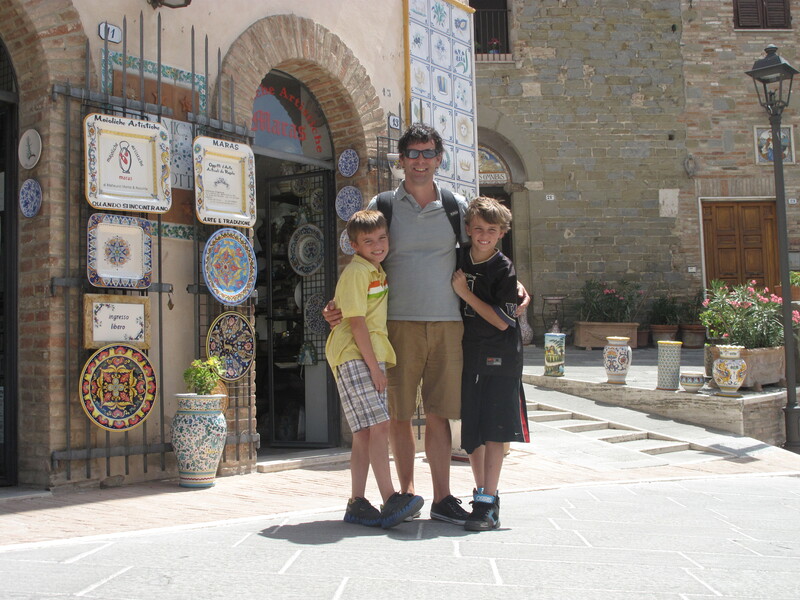 Umbria is famous for its green hills, cured meats, the town of Assisi, and most of all, its hand-painted pottery. Today we took a 20-minute drive to Deruta, the epicenter of this ceramic tradition. We arrived with the intention of outfitting our new apartment with a set of dinner plates, but the choices overwhelmed us. There were more than 100 small shops in the center of town and an equal number of ceramic studios on the outskirts, each one owned by an artist or family of artists. We browsed from one place to another admiring the intricate designs and beautiful patterns. Then, just as the boys were wearing out, Tom spotted a platter he just HAD to have. 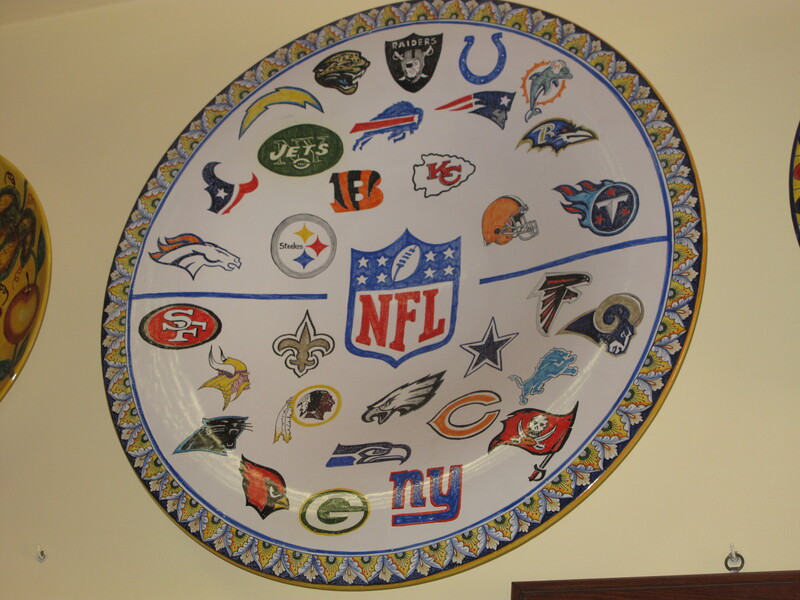 Unfortunately, it had been commissioned for the president of the NFL and was not for sale. We found another shop that our friend Kris Frossmo recommended. Upon entering, we were wildly greeted by Fernando, the proprietor. 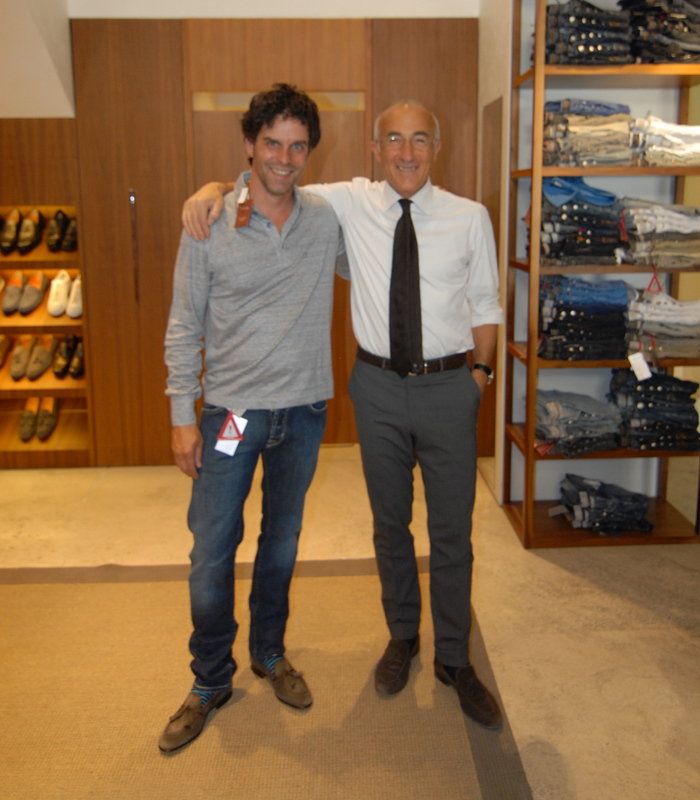 He stood up and embraced Tom and me then offered discounts on everything. We told him that Kris had bought some plates here years ago and suggested we visit, at which point Fernando gave me a big smooch on the lips. After I pulled away, he announced that he had another for my friend Kris. It was strange and awkward and a little juicy. We took pictures of some of our favorite pieces, but in the end, couldn’t make a decision. We decided to return to Deruta next week. On the way out of town we stopped at a super cute restaurant and encountered a couple mishaps. First, Ray got himself stuck in the bathroom for a while. We were talking to the owner and didn’t notice how long he had been gone. He returned to our table in tears telling us what happened. He explained that he finally got out after yelling, “Mi aiuta!” as loud as he could. Then after we finished lunch, as I was walking out the restaurant, I tripped on a step and fell flat on the floor in front of the staff. My entire body was on the ground. Several people rushed to help me up. My ankle hurt, my wrists were throbbing, neither injury equaled the humiliation. 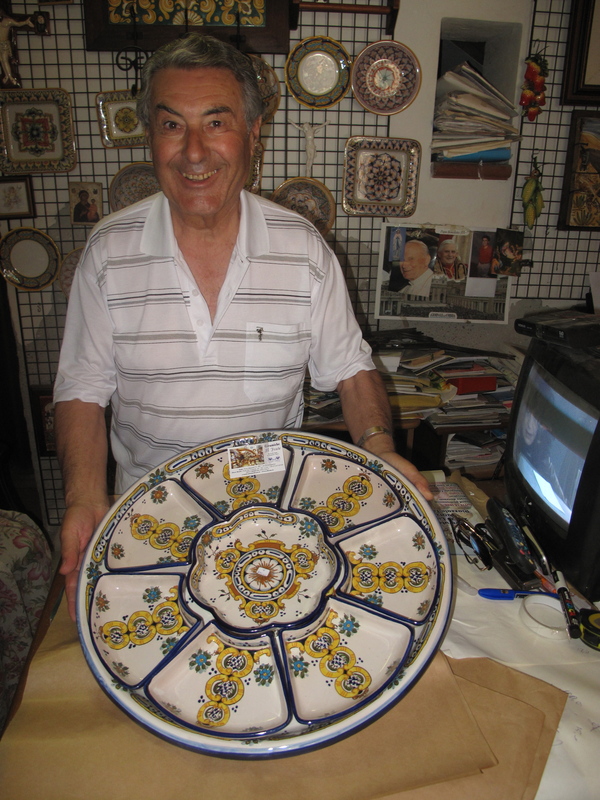 A serving platter with traditional colors and patterns of Derutian art. Fernando offered us a 100 euro discount. Ray loved this store. They sold tiles decorated with medieval games. The owner taught Ray to play, then invited him to her studio later this summer to paint a plate. An artist at work. All the pieces in this store were created by her and her sister. 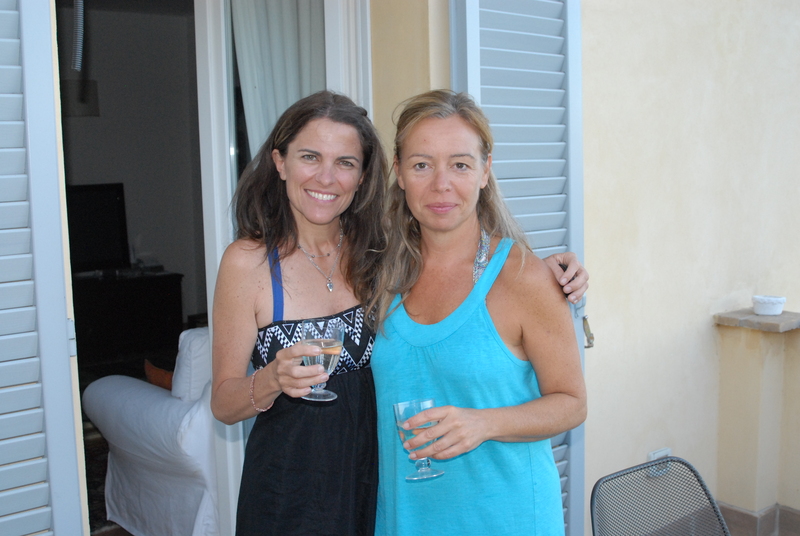 We just spent six hours, including a little pool party and outdoor feast, at Milena and Sergio’s. They are our landlords. Tonight, they asked us over for dinner. We arrived at 5:30 at their country home. 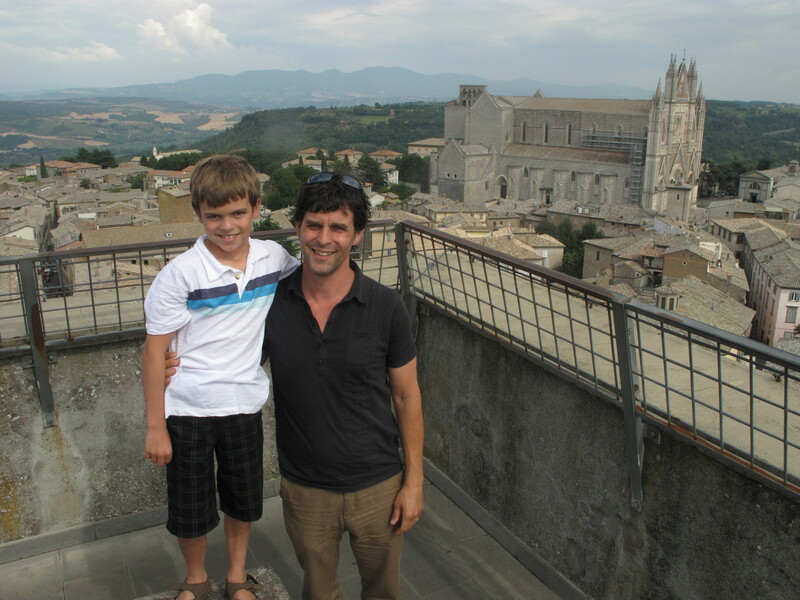 It’s a gorgeous, old, renovated house on the top of a hill overlooking all of Perugia. We spent the first half hour just taking in the view. Then they invited us to go swimming. I swear it was the most fun Tom and Ray have had here yet. 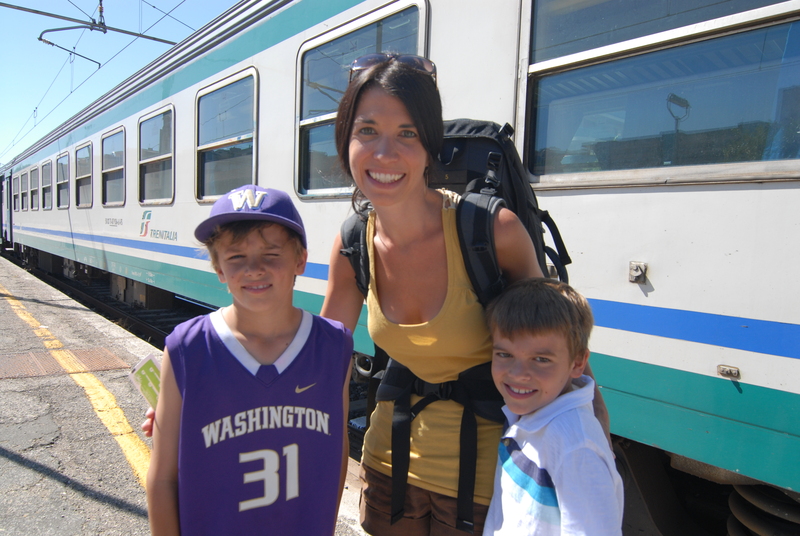 Milena and Sergio have a really sweet 10-year-old son named Massimo. Tom and Ray taught him some American pool games. But even translating the simple rules of water tag required quite a bit effort among them. 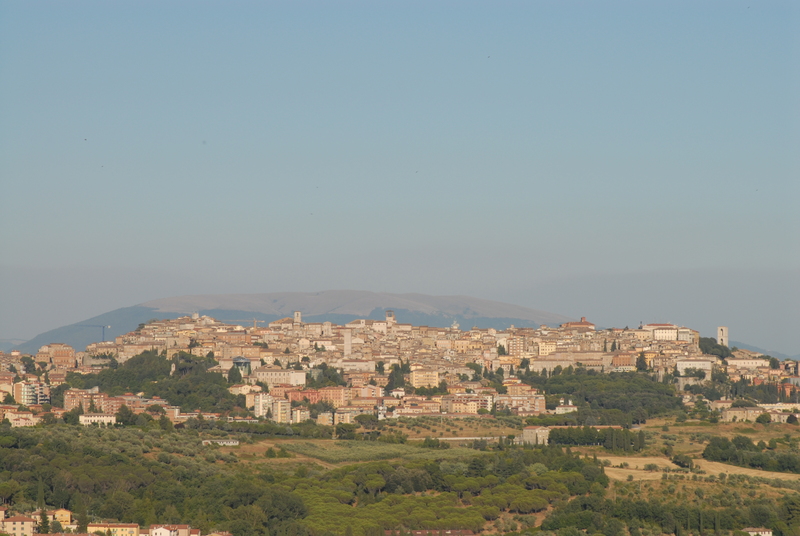 A view of historic Perugia from the pool. We can almost see our apartment in the top center of the city! 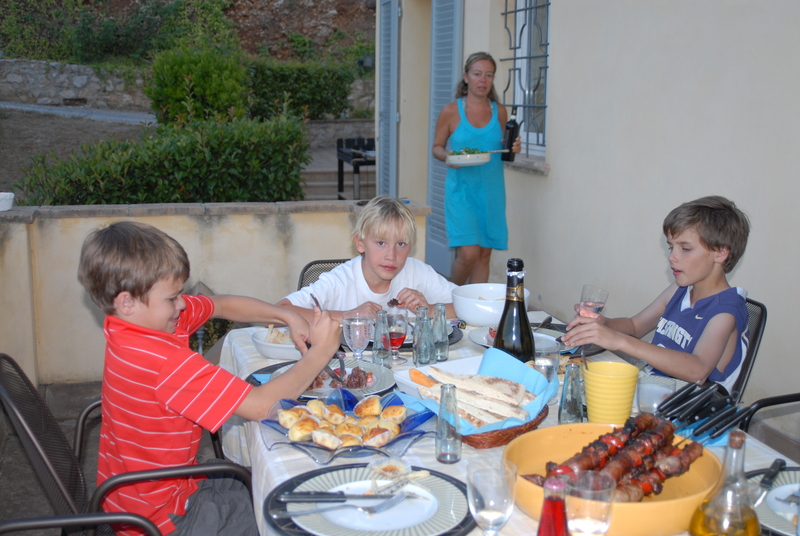 After an hour or two, Sergio lit the grill and Milena prepared appetizers. As Matt and I watched, we made casual observations in broken Italian about the garden, the photos in the kitchen, the olive oil and the barbeque. 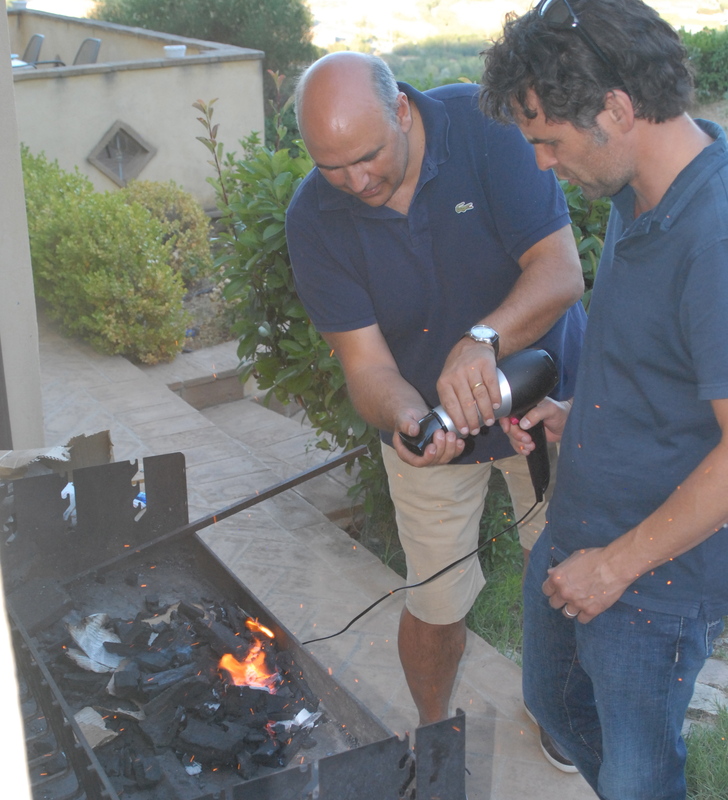 Sergio acknowledged that he’s never seen an outdoor gas grill in Italy. Then we watched him stoke the burning coals with a hair dryer. He even let Matt try! The kids finished eating an hour or two before the adults, so they went inside to watch TV and play Wii. And we continued to sit outside as it grew dark and then grew late. We talked about the economic crisis in Italy and how hard it is for Italians to find jobs out of college. We commented on the difference between real estate markets in America and Italy. We heard how Sergio and Milena met. We learned that while Sergio’s profession is an engineer, his passion is astronomy. They described Massimo’s extra curricular activities including horseback riding and non-competitive soccer. 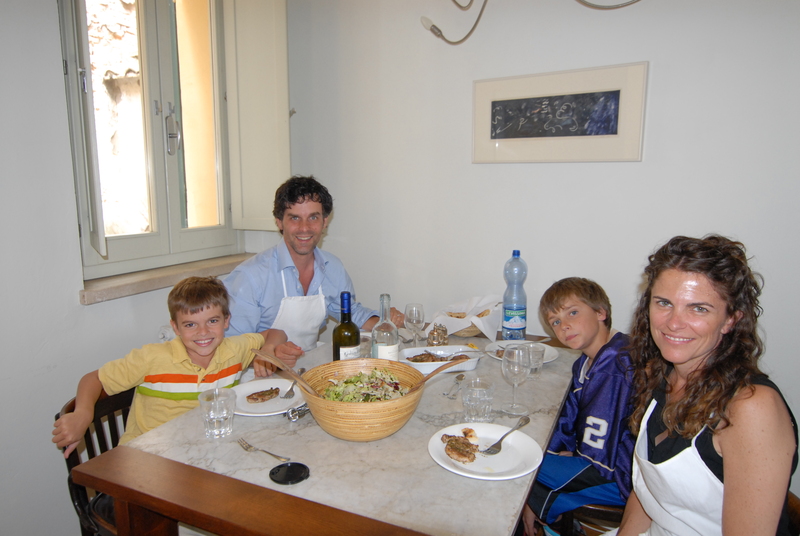 Later, the kids rejoined us as we ate a typical Perugian dessert called Salame del Re. A two-liter bottle of coke was passed around and the kids filled their glasses. Sergio offered banana liquor for us. Yesterday, we had dinner with an old friend. 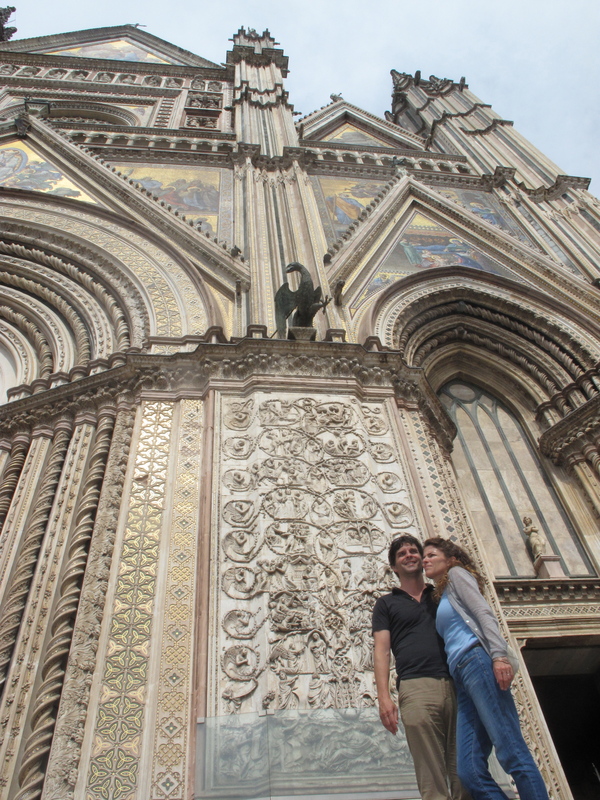 Krysta French and her husband Eric are spending their honeymoon in Italy. 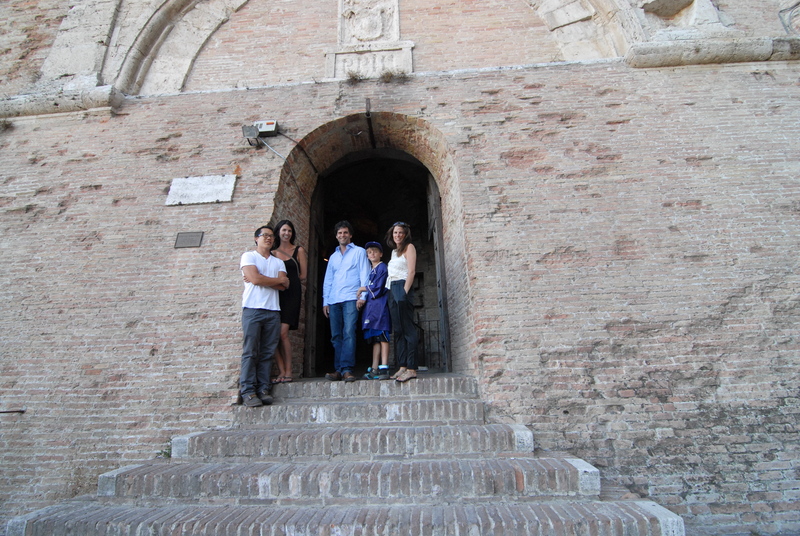 We convinced them to swing by Perugia for a visit. It was beyond wonderful to spend time with friends after our long week so far away from home. Before we sat down to eat, we thought we’d show them around. Since we are brand new to the city, there wasn’t much to point out besides a couple restaurants, the bank and the laundry mat. However, there is one impressive tourist site we remembered from our reconnaissance visit in April. 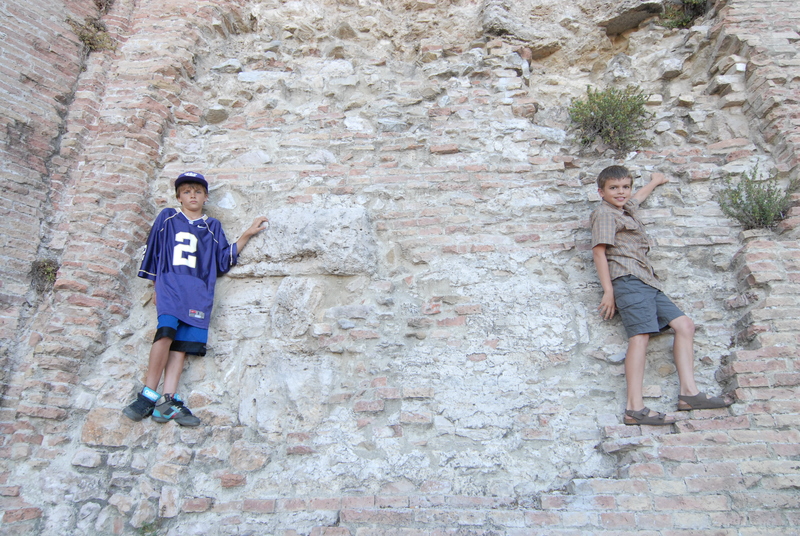 The boys hadn’t seen it yet either, so we took a walk to the underground city. Hundreds of years ago, shortly after the Salt War, which inspired Perugia’s tasteless bread, the Pope sought some revenge. He directed his army to pay a holy visit to this city and destroy it. The soldiers arrived and somehow managed to bury the ruling families’ homes and buildings and leave everyone for dead. (I think somebody needs to go to confession . . .) The Pope then erected a monument on top of the destruction and claimed victory. Ever irreverent and always the ones to have the last word, the Perugians snidely referred to his structure as La Rocca “the rock”. Later on, once the Pope was out of town, the Perugians destroyed La Rocca. Now, the underground city has been excavated and one may walk through its ancient corridors and stop for photos under the arches. Dinner with Krysta and Eric was great. We sat outside at La Taverna until midnight drinking wine, twirling pasta, and catching up. Waving goodbye. 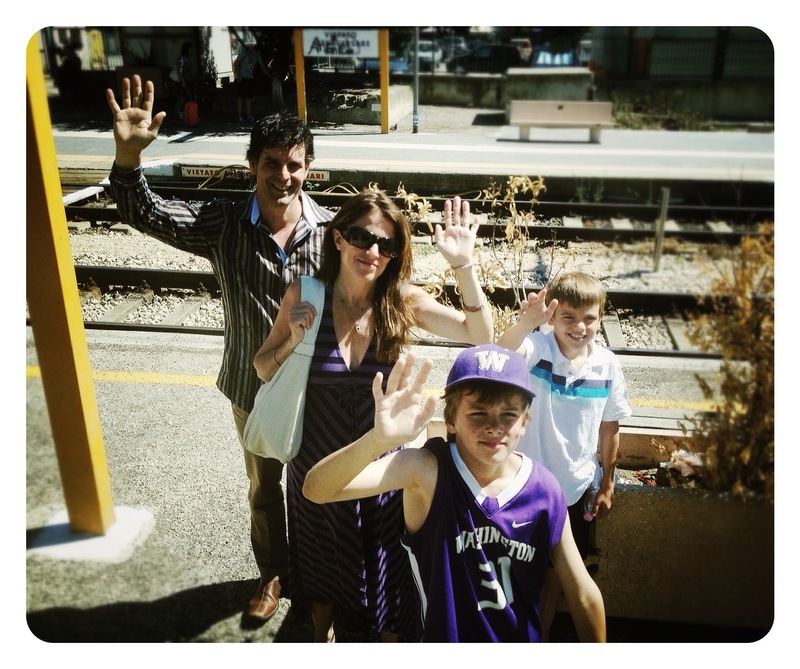 Photo courtesy of Eric Pan taken from inside the train as it left Perugia. Matt arrived with few possessions. 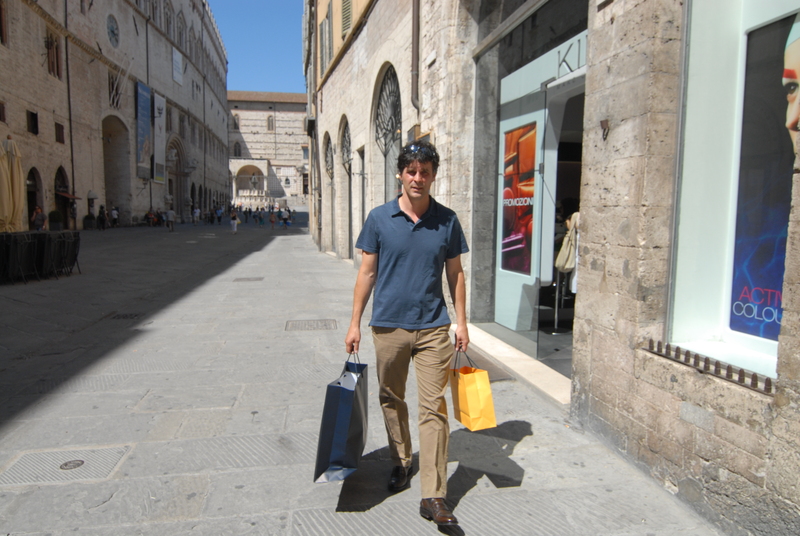 In preparation for our trip, he thinned out his closet to the bare minimum and decided that once in Perugia, he would build a wardrobe based on The Italian Look. During our first week here, Matt has clocked in several hours of shopping. Armed with a few key phrases, he takes afternoon excursions around our neighborhood. Once he finds a promising store, he quickly enlists the help of a salesperson, and after trying on several outfits, turns matters over to him or her saying, “Lei decida” (You decide). This offer always brings enthusiasm. Then colors are selected, choices are narrowed and outfits presented. And that’s where Matt begins to build his knowledge of Italian style. As the hem is pinned up, he learns that Italians wear their pants higher than Americans. The same goes for jacket and blazer cuffs. Men often wear long sleeve shirts in the summer and simply roll up the sleeves if it gets hot. Jeans of all colors are worn, as long as they are tight. And a scarf should be flared in a blazer pocket unless wearing a tie, in which case, it should be smartly folded. And of course, bathing suits should be much tighter and shorter than American standards. 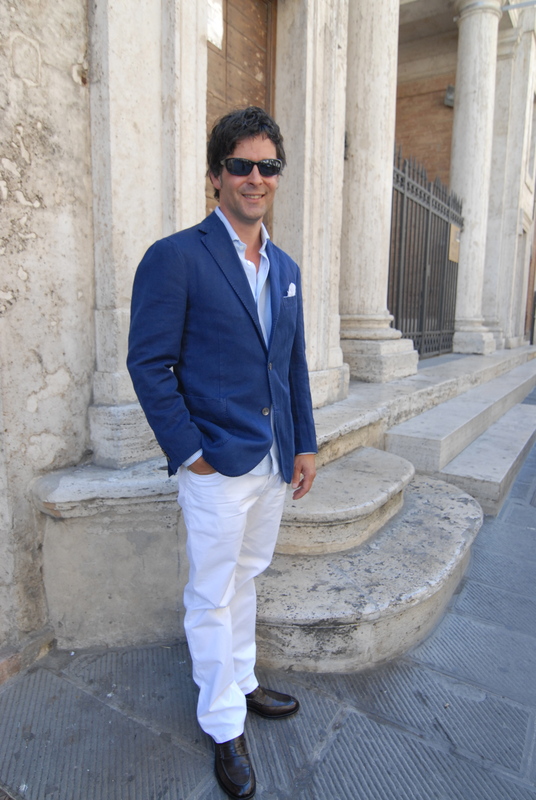 Yesterday, as Matt left the store, dressed in his new clothes, the owner called out, “Che fico!“ Which means something like, “That man looks fantastic!” in the Perugian dialect. Shirts may be left out, but Sergio prefers them tucked in, especially with jeans, so the brand can be easily spotted from behind. Matt’s becoming so Italian, he just might move back in with his mamma when he returns to Bellevue. Sleeves rolled up, shirt tucked in. Only 10 more days until we go to the beach! 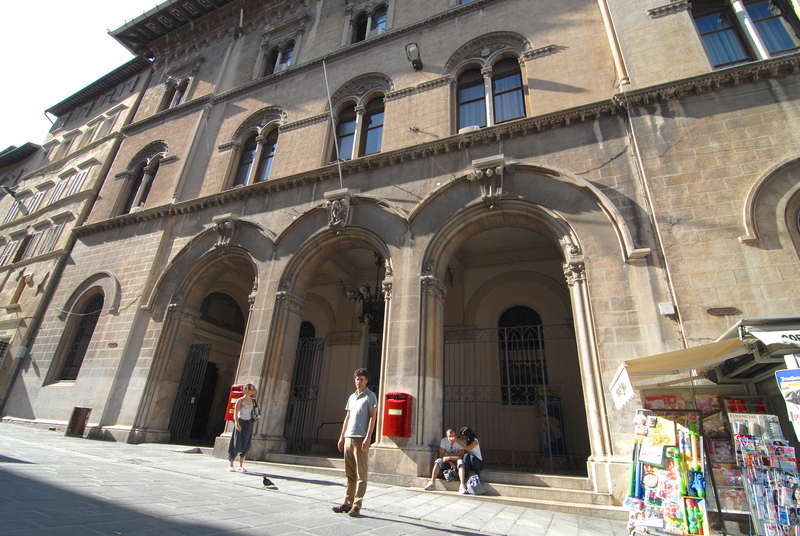 Matt in front of Perugia’s central Post Office. By then it was time for ice cream. With Umbria Jazz over, the line for gelato was less than five minutes. And the boys are finally getting the hang of how to make an order. 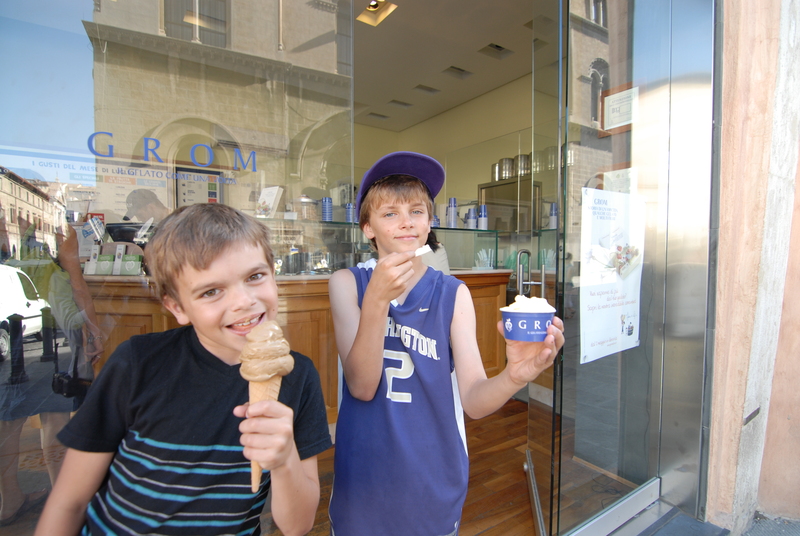 Here’s how it goes: They begin by specifying a cono or a coppetta depending on whether they want it in a cone or a cup. Then they select the size. 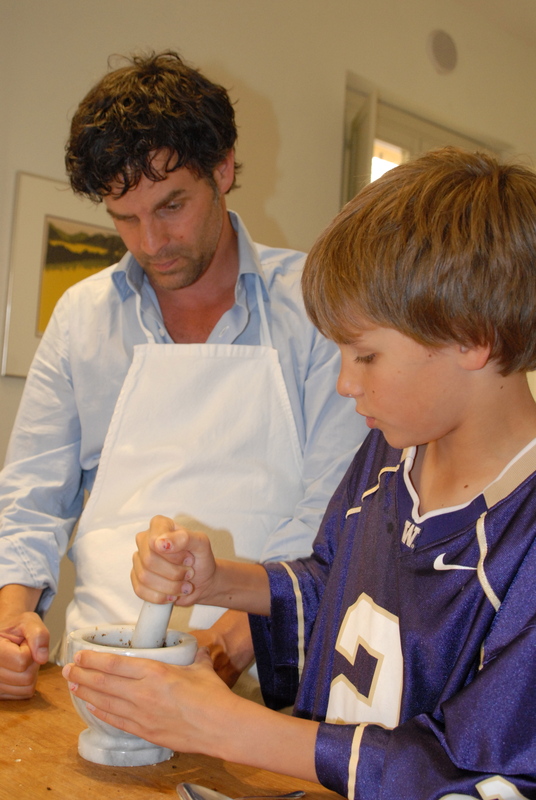 Italians don’t say, “one scoop or two,” (because the ice cream is transferred via a spatula). So instead, they say, “piccolo , media or grande”. After that, they chose the flavor. If they can’t decide between amaretto and peach, for instance, they have them both. Finally, the server may ask if they want panna. That’s Italian for whip cream. The last topic is bread. This would be insignificant except for the fact that our fridge is still broken and we’re still eating out every night. 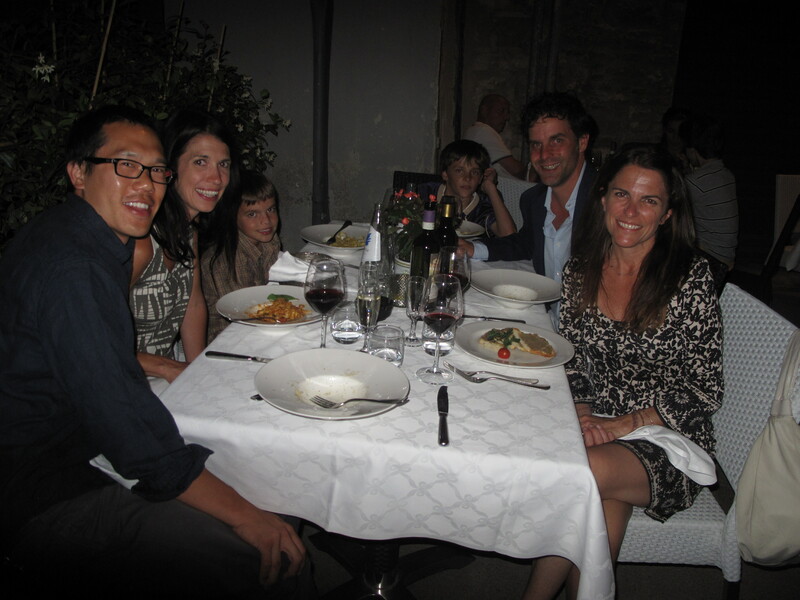 And since Italians don’t eat dinner till 8pm, and since we’re still acclimating, we sit down starving. Luckily, the waiter soon brings bread. However, it’s dry and tasteless . . . confusing . . . because everything else tastes good in Italy. The answer for this travesty: The Pope. Here’s the proud story we’ve heard repeated over and over. Hundreds of years ago, the Pope put a huge tax on the Perugians’ salt. They rebelled and didn’t buy his damn salt. The boycott worked, and to honor their victory, Perugians have never added salt to their bread since. Hilarious. In your face, Pope.